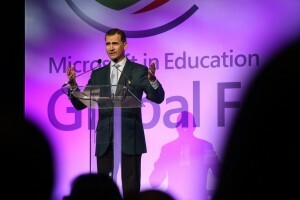 During the Microsoft in Education Global Forum, I was invited to attend an educational round table discussion with His Royal Highness, the Prince of Asturias and Gerona, Felipe de Borbon, the Crown Prince of Spain. I am a classroom teacher from an inner city, Title 1 middle school. I teach students from single parent homes, foster care, homeless and known street gang members. So, much to my surprise, I was approached by Microsoft staff and informed of this opportunity. I gladly accepted the invitation and was told I would receive additional information. Later that day, I received an email with a list of participants. I assumed there would be a lot of people involved in this round table discussion and I would have no reason to be nervous. I assumed wrong. Jukka Miettunen, Pedagogical manager at Maikkula School’s Patamäki unit in the City of Oulu, Finland. I was the only classroom teacher on the list of royalty, high ranking government officials, policy makers and educational leaders. Enter nerves. Thankfully, the intense nature of the Global Forum kept me focused and occupied over the course of the three days leading up to this meeting. At the conclusion of His Highness’ closing keynote, I was escorted to a conference room. His Highness entered, shook hands and sat. Everyone sat and the meeting began. I sat diagonally across the table from His Highness. María Garaña Corcés, President, Microsoft Spain, led the meeting, which was scheduled for one hour but lasted 85 minutes. For the first 40 minutes, I sat listening to the conversation, taking notes. I thought that perhaps this round table would take place without being asked a question. Then Ms. Corcés asked me to share my best practices from an inner city classroom with His Highness. I thanked His Highness for the invitation and began with a quote from Plato that is posted on my classroom door. Plato was talking about differentiated instruction 2,400 years ago. I shared my passion for Plato’s vision of education. I discussed differentiated instruction, choice boards, empowering students and student content creation. I mentioned my student created website – kidacademy.org – which showcases the best in student content creation. I mentioned that I held a unique advantage over the other round table participants in that being a classroom teacher allowed me to implement new teaching strategies and methodologies and witness firsthand success and/or failure. Ms. Corcés thanked me for my passion and dedication and the conversation went elsewhere. Later it returned to me when Anthony Salcito used me as an example of being innovative in the classroom. I was able to mention how teachers need to teach they way their students learn, not have their students learn the way a teacher teaches. A climate needs to be created in the classroom where students are not afraid to fail and mistakes are tolerated. After 85 minutes the meeting concluded, the His Highness shook hands and departed. I was so energized by this event I didn’t want to leave the room. I stayed behind and spoke with Karen Márquez, Kathleen Schwille and Meritxell Ruiz for about 15 minutes. Maybe they didn’t want to leave the room either. I was in awe of all of their work they were discussing. It was a surreal moment to be speaking to the future King of Spain His Highness the Prince of Asturias, Prince of Gerona, Prince of Viana, Duke of Montblanc, Count of Cervera and Lord of Balaguer. At 46 years of age, this moment might be considered the Crown Jewel (pun intended) for me after a lengthy career in education. While it was certainly special, it will not wrap up the life of this teacher. I have too much I still need to accomplish. I will consider it an exclamation point on a tremendously successful year in education. This entry was posted in 21st century skills, Beyond the Classroom, Building Teacher Capacity, Change Management and Culture of Innovation, Information, Leadership and Strategic Innovation, People. Bookmark the permalink.